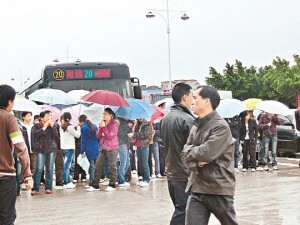 December 8, 2009 In the morning, workers were dissatisfied with their company’s long-standing practice of differential treatment--older employees’ base pay is only 33 yuan / day, while the new internship students recruited from a Vocational College are given 40 yuan / day. For a long time, the company has not raised wages, but food prices keep soaring which makes the workers unbearable to live. So this morning the old workers started the strike. At first, the assembly line workers just watch. After lunch the combination workers blocked the stairs and other workers and employees were not allowed to work. In the afternoon, all the workers (more than 1,000) began to join the strike and the production is totally standstill. The managing director of Gold Peak (Huizhou) immediately stepped in and started the negotiations with worker representatives, but did not reach an agreement. Tomorrow workers may continue the strike. Some poisoned workers are very concerned about the strike and they will be watching the development of the situation closely tomorrow as discrimination of payment also exists among the workers in the poisoned workers who are staying in the OSH hospital. Some of the poisoned workers plan to hold placards to protest against the plant’s unfair treatment.